Free EXPRESS post for this item. 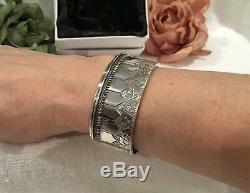 Exceptional Antique Vintage Victorian/Edwardian SOLID Sterling Silver- With Etched IVY Leaves-ETRUSCAN Style-Cuff Bangle- Measuring 2.5cm or 1 Wide-Weighs 32.19 grams -Excellent Condition. THIS BANGLE IS JUST BEAUTIFUL. Beautifully engraved on the front with Ivy leaves - I believe they represent: Friendship; Fidelity; and Marriage A Beautiful and Substantial piece - Weighs 31.19 grams. 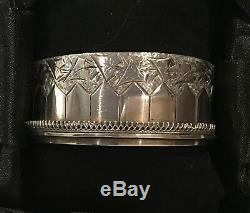 This beautiful Antique Sterling Silver Bangle is in excellent Condition. This wonderful piece is made of solid sterling silver, it is NOT hollow. The bangle is beautifully engraved on the front with Ivy leaves which I believe represent, Friendship, Fidelity and Marriage. Under the Ivy leaves there are pointed panels engraved across the front. Across the base is what I would call a silver frill resting on a silver lip, it is just stunning. 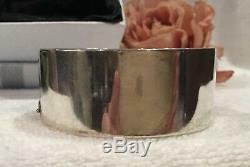 The back of the bangle has a polished finish and this lovely solid piece weighs 32.19 grams. It has a secure clasp which in excellent condition. On the tongue of the clasp is has been stamped "Sterling Silver". 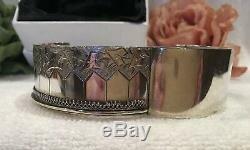 I have left a small amount of patina on the bangle which I think accentuates the pattern. This could be cleaned off if you wish. There is only one thing to mention for accuracy. A small piece of the frill has broken away near the clasp, I have taken a photo for you to see, please look at the 8th photo. This does not take away from the beauty of this piece. It is still in excellent vintage condition with no dints at all. This lovely Bangle is sterling silver and is stamped "Sterling Silver" on the tongue of the clasp. 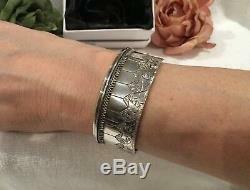 It is beautifully engraved on the front of the bangle with lovely Ivy leave and a beautiful detailed pattern. 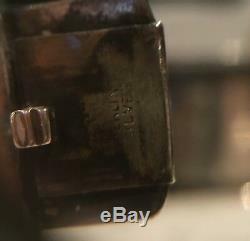 The bangle weighs 32.19 grams. Its clasp is in excellent working condition. It opens and closes as it should. 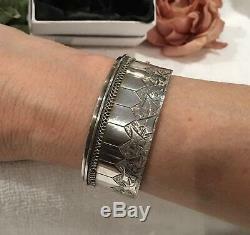 I cannot see any dints on this bangle, it is in excellent vintage condition. The Internal measurements of the bangle are approximately 5.5cm x 5cm, this really is quite a normal size for the time period. In inches it is approximately (2" & 3/16" inches by 2 inches). (These are the internal measurements, the space you have for your wrist). The external measurements are almost 5.8cm x 6.3 cm. 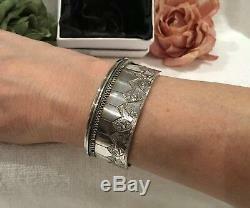 2.5cm wide (1 Inch) This Bangle will come in the Gift Box Pictured. I have described this item to the best of my ability. Please look at the photos as they form part of my description. THIS IS TRULY A BEAUTIFUL ITEM IN STUNNING CONDITION. A WONDERFUL GIFT FOR ANYONE including YOURSELF. THIS GORGEOUS AND SUBSTANTIAL PIECE IS SURE TO DELIGHT AND IS IN EXCELLENT CONDITION. THIS IS A FANTASTIC ORIGINAL ITEM. IT IS IN FANTASTIC VINTAGE CONDITION. PLEASE REMEMBER, THIS IS AN ESTATE ITEM IN VINTAGE CONDITION. This lovely item is from my own personal collection. Make sure you look at my photos they form part of my description and I have described this item to the best of my ability. 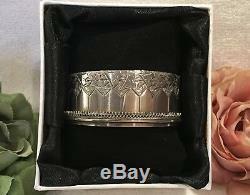 The item "ANTIQUE VINTAGE VICTORIAN/EDWARDIAN SOLID STERLING SILVER-CUFF BANGLE-32.19 gram" is in sale since Wednesday, September 26, 2018. 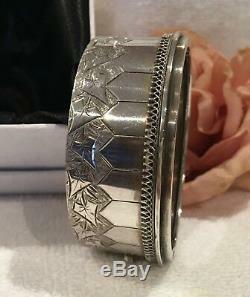 This item is in the category "Jewellery & Watches\Vintage, Antique Jewellery". The seller is "nathan11185" and is located in Kincumber, NSW.